One of the easiest ways to add some decor to your space is to add candles. Candles add warmth and a soft natural glow to any room! These cute little aged metal candles would go perfectly in any setting; indoor/outdoor, craftsman, industrial, modern, you name it! 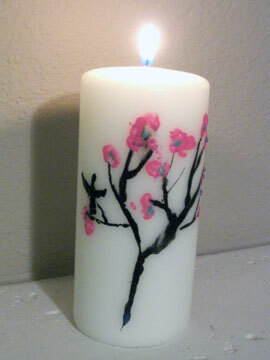 I could definitely see these looking adorable in a fireplace..
Did you know that you can paint candles with crayons? Me either. The entire process is easier than you'd probably think! 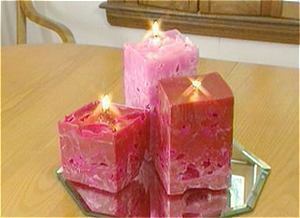 Use old crayons to embellish plain candles. Exclusively from A + R, these vivid, soy Building Brick Candles have a wick in every stud, and they'll make a LEGO fanatic's heart leap with joy, which may or may not make up for the $48 price tag. Turn simple wine glasses into lovely tealight lamps thanks to these equally simple DIY lampshades. The shades themselves are made of vellum. They might be just the thing for an upcoming spring wedding! Fill balloon with tepid water. Melt your wax in the double boiler to 180 degrees Fahrenheit. Slowly dip your balloon into the wax, hold it for a few seconds. How to make ice candles. Holidays equals candles for lots of folks, but it turns out that your average candle is not as green as it could be. Nothing sets a festive mood like a fresh lighting scheme. From tiki torches at a summer BBQ to a full-on romantic candlelit dinner on Valentine's day, there's always something incredible about the unique glow at special occasions. They look like any white pillar candles...until they're lit, that is!! As they melt, they ooze bloody wax down their sides. Delightfully creepy!! Available at Wrapables ($8 for the small, $11 for the large). Via. Perfect for the patio, deck or just nestled in the backyard are these sweet and simple candle holders. To make them, you'll need to get yourself some coffee cans from an obliging restaurant, punch a few holes in them with a can opener and then spray them down with spray paint. Via Apartment Therapy. The Bravit Candle by Christope van Bömmel consists of a sheet of wax that is imbedded with a web of wicks. The original flame ignites the subsequent wicks, each dying out over time. Lovely and dramatic. Via. How to embellish a plain candle--in about a minute. Craft Ark has a quick technique to embellish plain pillar candles. Supplies are minimal and include metal daisy embellishments and split pins. Simply bend the petals of the daisies; hold daisies to candle and then push a split pin (brad) through their center holes and into the candle. Okay, the Ristoranti Candlestick post provoked a discussion of those drippy Chianti candles, which turned up this item: An entire candle in the shape of a Chianti bottle. It's available through Paisley Creek for 20 bucks. The Craft Ark has a quick and EASY tutorial on how to turn those mini pumpkins into darling tea lights. Three steps and you’re done. Multiples of these would be cute as a centerpiece or mantle decoration for not only Halloween but Thanksgiving as well. If you have some leftover scraps from your latest woodworking project, how about using them to make votive candle holders? They’re easy to produce and beautiful when completed, which means you might want to make a few for yourself and some to give as gifts.